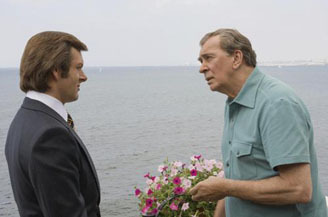 Ron Howard's Frost/Nixon is a tense, involving drama about two men who always assume too much about each other. While it recounts the real-life interviews between David Frost and former president Richard Nixon, it has the mood and tone of great fiction. As with Milk, the facts and reality of the situation seem beside the point. What matters is the dynamic storytelling and terrific performances. Frank Langella reprises his Tony Award-winning role as Richard Nixon, the infamous 37th president who will forever be linked to the 1974 Watergate scandals. The film opens with archival news footage of the events, including a reading of the Supreme Court's unanimous decision that forced Nixon to hand over his recorded White House conversations, which ultimately revealed his involvement. Ten days later, Nixon resigned as president and was later issued a full pardon by his replacement, Gerald Ford. David Frost (Michael Sheen), the charismatic and often flippant English talk show host, watches Nixon's departure from the White House on television, with his famous waving of arms and peace signs. Close-ups between Frost and Nixon suggest the two are exchanging their first menacing glances. Even though they haven't met each other yet, the television connects them. Frost asks his producer, John Birt (Matthew Macfayden), how many viewers watched Nixon's helicopter exit and tells him he wants an exclusive interview with the man. Birt and others think Frost's chances are slim. After all, Frost is but a mere talk show host - light, humorous, and hardly serious. People consider him a man with little political knowledge or convictions. "But he knows how television works." Ironically, those same qualities prompt Nixon to agree to the interview. He and his post-presidential Chief of Staff (Kevin Bacon) figure Frost for an ignoramus and an unworthy opponent who won't challenge Nixon on any hard issues. Unlike other high-profile news anchors like Walter Cronkite, Frost would pay for the interviews. Nixon's literary agent, Swifty Lazar (Toby Jones), settles on $600,000 for four 90-minute sessions. Frost pays despite no guarantee he'll be able to sell the footage to any major network. With the aid of two American investigators, James Reston, Jr. (Sam Rockwell) and Bob Zelnick (Oliver Platt), and his new girlfriend (Rebecca Hall), Frost, unprepared and inexperienced, sets out to interview one of the world's most controversial figures.